My So- Called Handmade Life: Oh Yeah, I Was Gonna Do a Christmas Post. Oh Yeah, I Was Gonna Do a Christmas Post. Oops. I hope you all had a great Christmas. I'm going to get right to the point: I have conflicted feelings about Christmas. 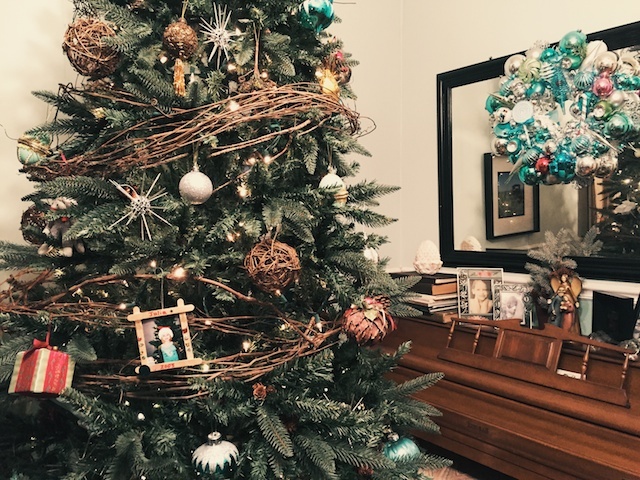 As far as celebrating Christ's birth, I love it; but I used to feel torn between visiting multiple families on both sides of mine and my husband's families. It was hard to travel so much with young children, and it seemed that no matter how I ordered visits or alternated Christmas and Thanksgiving, someone was always disappointed. I'd pick up on people's emotions, absorb them, and trying to fix their discomforts. I spent every Christmas of my adult life carrying a level of anxiety about someone being disappointed in what I cook, when I arrive, when I leave, whether or not we visited that year, etc. It never felt quite right. 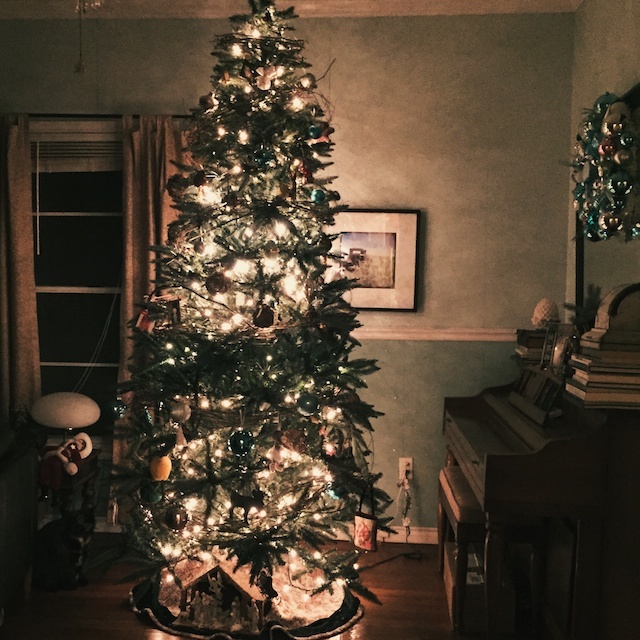 When one side of the family quit wanting us to visit at Christmas, we knew it was time to start having Christmas at our home where we'd welcome anyone who wanted to come. My kids are now 19 and 15, it is past time. This doesn't mean I don't value the traditions of my parents and grandparents. I do and we still, pretty much, do the same stuff, only we only leave home to visit my father later in the day. So, I had my grandmother's favorite Christmas meal: shrimp gumbo, rice, potato salad, and pecan pie at my house and that part of our family came over for a quiet little get together. Could that menu sound more southern? I was so pleased to see her enjoying herself. She's has had a rough year and going anywhere with a spouse that has dementia can be nerve wracking. But they were able to stay for such a long time, compared to Thanksgiving. Something that always amazes me is how the fog of dementia can clear in an instant and my grandfather's personality emerges from it for a few minutes. It is a Christmas gift. At Thanksgiving, my grandmother was making conversation by showing him an enlarged photo of his that I keep over my couch. It is of him on his horse during World War 2. You can see it here. She asked him, "Where were you when this was taken?" Now, there's no way he could tell her that at this point. But sometimes she tries anyway. He looked at it for a minute, knowing he didn't know, and said, "Well, I was on a horse." We all cracked up. She rolled her eyes and said, "Well then, where was your horse when this was taken?" His answer, "He was under me." That is my Papaw coming out of the shell in the best way he can for a little bit, before it covered him over and he felt so lost and uncomfortable that they had to go home. 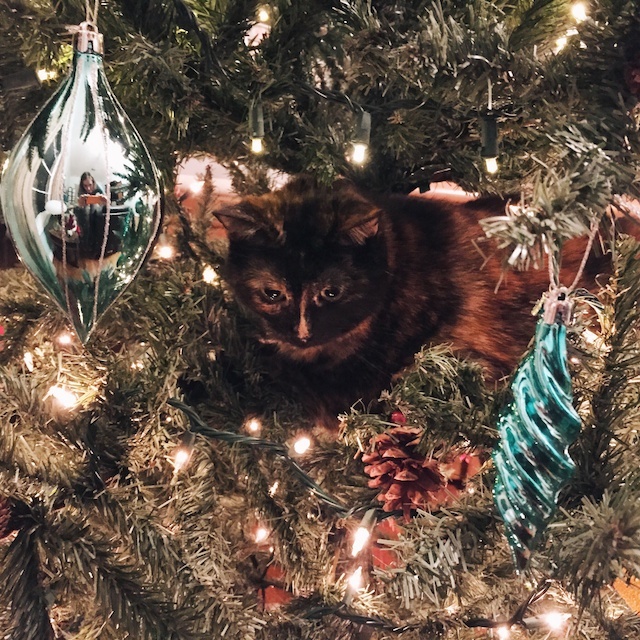 So, during Christmas, I didn't expect him to stay long. He was having trouble placing all of our names, though I can feel he still has an emotional memory of us. He was quiet and didn't feel like eating all through lunch, but he did let my grandmother enjoy the conversation. We heard about their dog, Ringo, a dog so spoiled that in his old age she would leave her walking shoes on the front porch and wear high heels out the door, so he wouldn't be suspicious. Once outside, she would sit on the porch and switch shoes so he wouldn't know she was going on a walk without him. Anyway, afterward as we finished opening presents, my grandfather pointed to that same photo over my couch and said, "Isn't that my picture?" I said, "Yes, it is." and took it down so he could hold it. As he took it, he immediately remembered, "That was when I was in the First Cavalry at Fort Bliss. Was it 1943? You know that horse's name? R992." You just never know when it will happen. I felt good about my part in Christmas this year. I felt like I was where I should be, doing what I was supposed to. Everything is obviously not perfect. There are sorrows and changes, but I felt like I was doing what I was made to do. I hope you all had a wonderful holiday and will celebrate the new year with people you love. By the way, I was poking around online and found a field training video of my grandfathers cavalry division just before they went mechanized. Scroll down a ways and it's the sixth video from the top. (I am posting this mainly for myself.) He's in there somewhere. I'm glad that you and your family had such a lovely Christmas. I hope you enjoy the rest of the Christmastime season. My mother-in-law has had Lewy Body dementia for about 5 years now, at such a young age-- she's only 71. Watching her sitting quietly, being fed by my father-in-law, made me remember the same woman who ran the whole event and sat on the floor playing with the grandkids. I'm sorry your family is going through the same thing, but I'm glad your Christmas was good. It's very difficult when loved ones have dementia. My gran gets all her grandkids' names mixed up and gets very angry and aggressive because of her frustration. It must be so hard. I'm glad your granddad does remember things. Hope you had a lovely Christmas despite the difficulties. Thank you, Bridget! I wish the same to you and your loved ones. Oh, Anya, I think seeing this happen to someone so young, like your mother-in-law, must be much harder. My grandfather is almost 95 and we've had a few years to adjust to this idea. It's never easy, though. The hardest job is that of the caregiver, or spouse. Though my grandmother doesn't have to actually do many physical things for him anymore, she does answer questions all day long. I'm sure it seems maddening to her, at times. I have to believe that even with poor memory, they at least have emotional memory of being with us. Our moods and love we show must affect them in some way. So, the time you spend with your mother-in-law is still such a blessing to her and your father-in-law. I hope you have a very blessed New Year, Anya. I did, Sabs! It's weird how a few Christmases ago we would've wondered how we'd ever have a good Christmas if my grandfather didn't remember us. But here we are, and we still did. It's easier when they don't get agitated. He does get that way, especially in the evenings. But, my grandmother is being very faithful and trying to be patient. It helps to have other caregivers come in for some things and just "reset" the moment. I hope your Christmas was good too, and that you New Year is full of wonderful surprises. I always receive Christmas with mixed feelings. It used to be a happy break when I was a child but as you grow up, you see that it's a season full of commitments and absences. I'm glad you've made the most of it. That's a good way to say it, Elena. Commitments and absences. As a Christian, I really want to focus on Christ at this time (even if He wasn't born in December) but stress and sadness compete for my attention. I feel like we're finally striking a balance that is good for everyone, but I had to let lots of things go to do it. Thanks, Vanessa! We did. I hope yours was wonderful, too. Yes, Christmas can be a bittersweet time. I am glad that you were able to spend it with your husband, kids and grandparents. My dad also has dementia and I know that it is difficult for my mom on so many levels. Wish they were closer to me and not in Vietnam so that I can help them. It is such an unpredictable condition, where you can't help but hang onto and treasure those brief moments of clarity and flashes of memory. That's it, exactly. One thing I did a few years ago was to record my grandfather telling about his childhood and war stories, etc. It was before he forgot it all, but after he was forgetful enough to not mind a camera focused on him. They are all out of order and disorganized on my computer, due to an accidental deletion, but they are there for a day when I have time to watch them. I hear many people talk about how hard it is to be the relative that lives nearby, taking care of a dementia patient/ or elderly person's regular needs, but I know it must be extra hard to be far away, wondering and missing them. Then all we can do is support from afar and pray. We can always do that. I hope you had a good Christmas, Tien, and that you're parents are doing alright, too. May you both have a wonderful 2015.